2. The 31st and 32nd Board of Directors’ Meetings were also held in conjunction with the 19th General Meeting and Seminar. 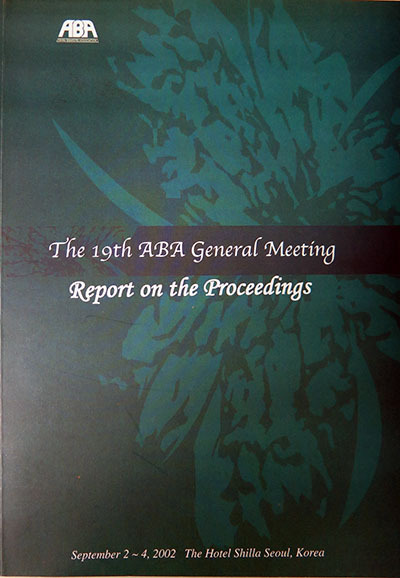 During these meetings, the ABA Board of Director’s members discussed internal policy matters, reviewed the status of the various ABA projects and programs, and elected new officers and members of the Board who would serve for the term 2002-2004. 3. Governor Park Seung of Bank of Korea inaugurated this year ‘s general meeting. In his Keynote Address, Governor Park discussed the financial reforms that have been pursued in Korea since the 1997 Asian financial crisis. The government, he said, adopted a two-pronged approach. It injected public funds to improve the soundness of the financial sector, and at the same time it pursued a resolute campaign for internal reform by the financial sector itself. Gov. Park called on Korean financial institutions to be competitive in the international financial markets by, among others, securing good human resources, developing rigorous risk management systems, and securing fair and equitable market discipline. He also underscored the need for closer cooperation within the region’s financial sector to overcome financial crises. The full text of Governor Park’ s Keynote Address is attached as Annex 1. 4. In the Welcome Remarks, Chohung Bank Chairman Mr. Sung-Bok Wee noted the rapid changes changes faced by the financial industry rapidly in recent years as a result of developments such as deregulation, the advance of information technology, and the globalization of markets. He said that that in response, Asian financial institutions have increased in size and diversity to cope with the challenges from international competition. Mr. Wee underscored the need for Asian financial institutions to promote mutual cooperation to help deal with those challenges. The full text of Mr. Wee’s Welcome Remarks is attached as Annex 2. 3. Outgoing ABA Chairman and ROC Finance Minister Dr. Yung-san Lee in his Opening Statement said that the new Basel Capital Accord is a central element in bank supervision that will facilitate the development of a sounder and safer global banking system. He stressed that the proposed accord presents great challenges not only for banks but also for regulatory and supervisory authorities. It would require extensive preparation on the part of financial regulatory and supervisory authorities, significant legal and regulatory changes, and intensified international cooperation among relevant authorities. The full text of Dr. Lee’s Opening Statement is attached as Annex 3. 6. 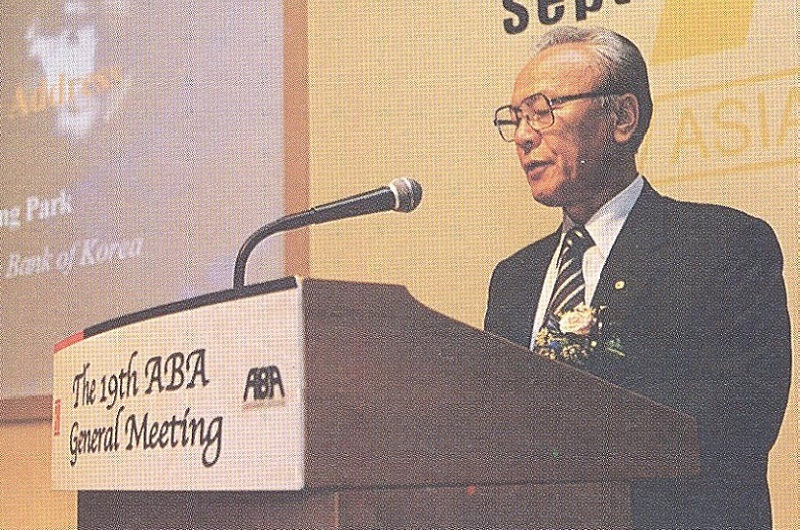 In his response to the Keynote Address of Governor Park, ABA Chairman Emeritus Dr. Jeffrey L.S. Koo praised Korea for leading the way in financial and corporate restructuring and upgrading the quality of risk management in the banking sector. He said that as the first Asian country to fully recover from the recent financial crisis, Korea is a good case for other countries in the region to study. He said that risk management is the key to preventing another financial crisis, and so is the need to prepare for the new Basel Capital Accord. The full text of Dr. Koo’s Response is attached as Annex 4. 7. This year’s seminar focused on the theme ”The New Basie Capital Accord and Its Impact on Asian Banking.” Experts and other eminent personalities spoke on issues surrounding the proposed Basel Capital Accord and what their implications are for Asian banking. Speakers included Mr. Stefan Hohl, Senior Economist, Bank for International Settlements (BIS); Mr. Nestor A. Espenilla, Jr., Managing Director, Supervisory Reports and Studies Office, Bangko Sentral ng Pilipinas ; Mr. Joseph Y. W. Pang, Executive Director and Deputy Chief Executive, The Bank of East Asia, Ltd.; Prof. Grace S. Ugut, Associate Professor, Executive Education, Asian Institute of Management; Prof. Kevin Davis, Holder of the Commonwealth Bank Group Chair of Finance; Mr. John M. Burton, Vice President and Asia Pacific Market Manager, Moody ‘s Asia Pacific Limited; and Dr. Kun-Ho Lee, Managing Director, Chohung Bank. 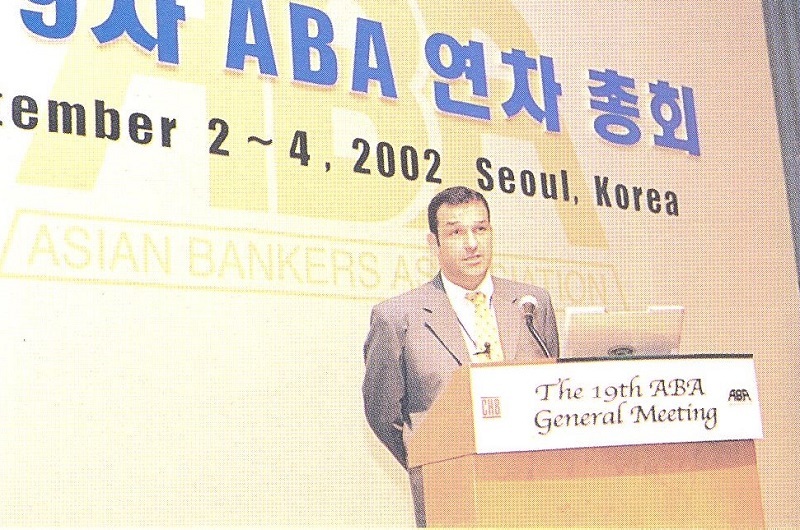 Serving as session chairmen were Mr. John Winders, Managing Director Asia of ANZ Banking Group Ltd., Prof. 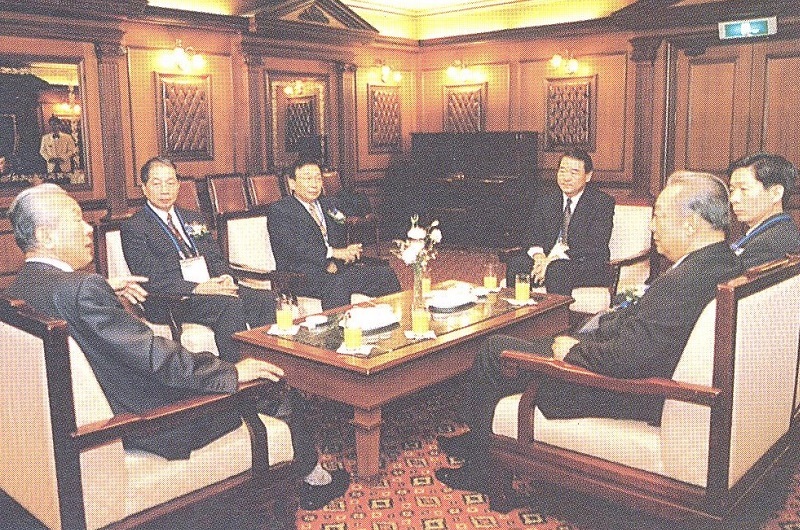 Sang Kee Min of Seoul National University, Mr. Valentin Araneta, President and Chief Operating Officer of Rizal Commercial Banking Corp., and Dr. Choong Yong Ahn, President of Korea Institute for International Economic Policy. 8. Mr. Hohl and Mr. Espenilla gave an overview of the new accord and its impact on bank regulations and on risk measurement and management procedures They shared their insights on how supervisory authorities in Asia are to implement the new accord in ways that would promote greater stability and competitiveness in the region’s banking system. Mr. Pang and Prof. Ugut talked about the basic realities surrounding the implementation of the new accord and the issues involved from the perspective of banks operating in Asia. They identified challenges that the new accord will pose to Asian banks, as well as the problems and difficulties they will have to contend with. Prof. Davis and Mr. Burton spoke on concepts, methodologies and practices in modern risk management, pricing, and capital provisioning. They discussed problems in measuring and managing operation risk, credit risk, and market risk required in determining the minimum capital requirement of banks. Dr. Lee shared the experience of Chohung Bank – cited as one of the most successful cases of bank restructuring in Asia – in improving risk management, overhauling its organization and internal processes and adopting international standards. 9. The ABA Board of Directors discussed internal policy matters and reviewed the status of the various projects and program during its 31st and 32nd meetings held in conjunction with the seminar. Among others, the Board adopted the Audited Financial Report for the period ended December 31, 2001; approved the membership application of Rashid Hussain Securities Sdn. Bhd. From Malaysia, Taiwan Finance Corporation, Industrial Bank of Korea, and Korea Credit Guarantee Fund, as well as endorsed the re-admission of Kookmin Bank into the Association; adopted the proposed budget for 2003; and approved the ABA Work Programme for 2002-2004. 10. As part of its continuing policy advocacy efforts, the Board approved a position paper entitled ”Strengthening Asia’s Financial Systems.” In the paper, ABA called for a more active cooperation within bodies such as the APEC forum to restore investor confidence in key markets while accelerating the resolution of bad debt problems and further strengthening Asia’s financial systems. It also reiterated its call for measures to promote the development and integration of Asia’s bond markets, to promote the development of a robust and credit domestic credit rating industry in Asia, and to assist bank supervisory authorities in preparing to implement the new Basel Capital Accord. ABA also urged APEC to initiate capacity-building measures aimed at promoting among bank supervisory authorities a greater understanding of risk management practices, as well as developing effective regulatory and supervisory approaches to encourage wider adoption of robust risk management practices within the region’s banking community. Australia – National Australia Bank Ltd.
Hong Kong – The Bank of East Asia, Ltd.
New Zealand – ANZ Banking Group (NZ) Ltd.
Philippines – Rizal Commercial Banking Corp.
Sri Landa – Hatton Nation Bank Ltd.
12. Amb. Alfonso T. Yuchengco, Honorary Chairman of the Rizal Commercial Banking Corporation of the Philippines, was installed as the new ABA Chairman, replacing Dr. Yung-san Lee, former Chairman of the International Commercial Bank of China and currently Minister of Finance of the Republic of China. Elected as new Vice Chairman was Mr. Sung-Bok Wee, Chairman of the Board of Chohung Bank, who would assume the ABA chairmanship in 2004. The full texts of Amb. Yuchengco’s Acceptance Speech and Dr. Lee’s Valedictory Speech are attached as Annexes 5 and 6. 13. The Advisory Council admitted two new members, namely, Mr. Toyoo Gyohten, President of the Institute for International Monetary Affairs and Senior Advisor of the The Bank of Tokyo-Mitsubishi Ltd., and the Hon. Gabriel C. Singson, Former Governor of the Bangko Sentral ng Pilipinas and currently Chairman and President of JG Summit Capital Markets and Corporation. 14. The Board agreed to hold the 20th ABA General Meeting and Seminar in Manila in 2003, with the Rizal Commercial Banking Corporation as host, and the 21st General Meeting and Seminar in Hanoi in 2004, with The Bank for Foreign Trade of Vietnam as host. The dates and themes of the meetings will be determined later by the ABA Planning Committee in consultation with the host banks. 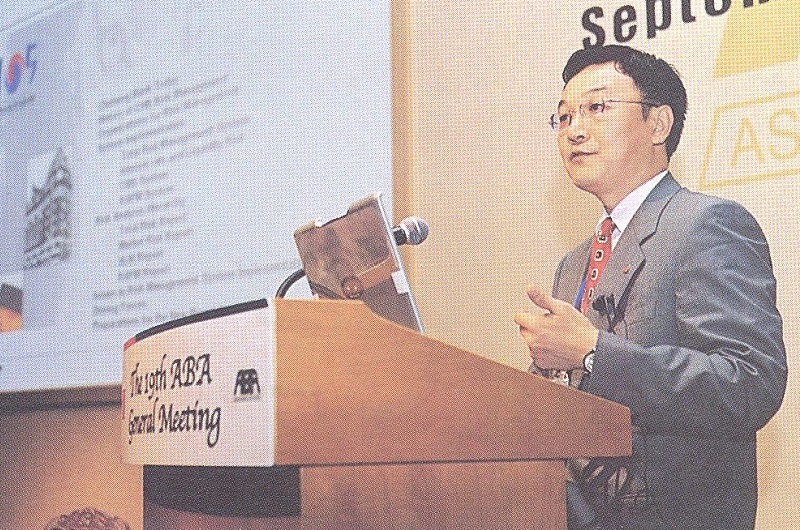 Organization of ACRAA – With the support of the Asian Development Bank (ADB), ABA convened the organizational meeting of the Association of Credit Rating Agencies in Asia (ACRAA) on 14 September 2001 at the ADB Headquarters in Manila. ACRAA is composed of 14 credit rating agencies from 10 Asian countries. 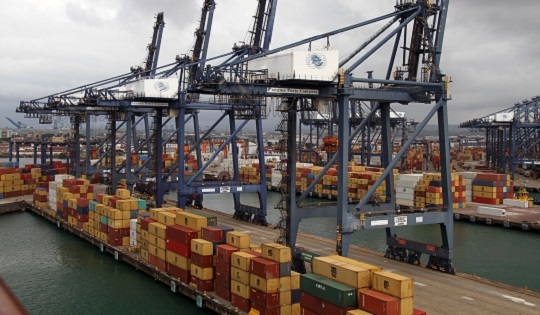 It was established as part of ABA ‘s overall efforts to promote the domestic bond markets in the region. 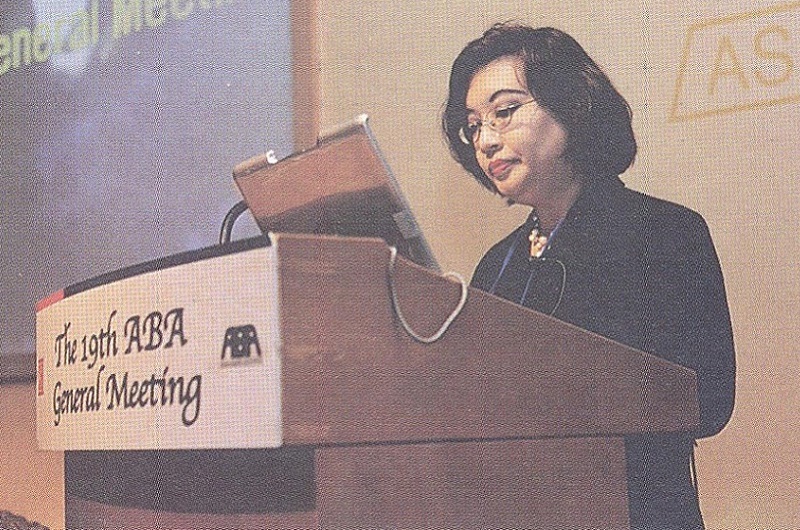 Professional Development Program – ABA commissioned the Asian Institute of Management to conduct a bank management course focusing on ”The Impact of Globalization on Banking ” on 3-14 December 2001 in Manila. Preparations are underway for a course on ”The New Basle Accord and Its Implication to Asian Banking Business” to be held from December 2 to 6, 2002 in Manila. The full text of the Chairman’s Report is attached as Annex 7.